Mark Stoughton crossing in front of Bill Brangiforte. This is something that Never, Ever happens. Conditions were a bit wetter, and a lot warmer but a lot less blustery for the thirteen hardy souls who braved the rain for the fourth week of frostbiting at Barrington. Light winds and friendly tides were the order of the day, and there was a lot of close racing. 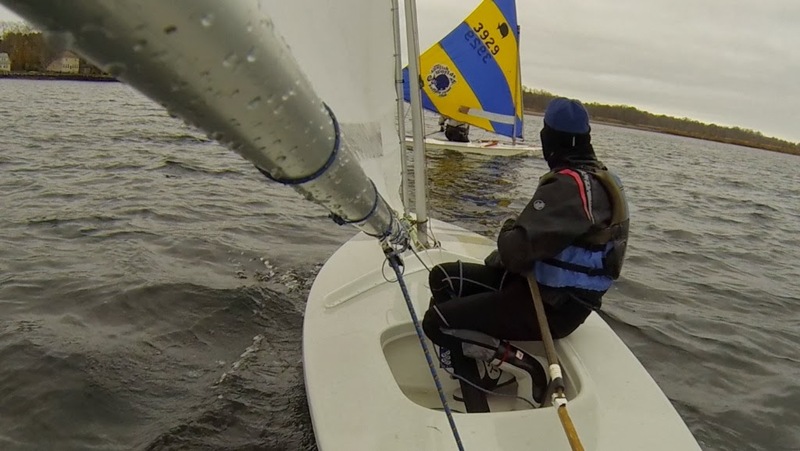 Five races were run today in winds that ranged from light to nonexistent. Huge leads were gained and lost over the course of a leg as people sailed in and out of puffs. Overlaps were all the rage at the marks, generating some spirited on-the-water debate about the racing rules among the skippers. Bill Brangiforte took the day in the A fleet, while Mark Stoughton built on a personal best 5th place finish in the first race to take the B fleet. We tried a little something different this week. We had two BoatCams on the water today. We also have some special plans for the BoatCam later this year, so stay tuned. Same Boat Time, Same Boat channel!